What a fascinating week in politics! Many commentators are saying that the legislative processes of the federal Parliament have never been more on public display. Tactics employed by Senators over the voting legislative changes tested the boundaries of reasonableness as the all night saga continued. If you’re a political tragic you might have enjoyed the big Senate show overnight. However, if you don’t take that much interest in politics it may have been a bit confusing. Yesterday the president Stephen Parry took the chair at 9:30 and opened the Senate. They’ve just finished. In a normal workplace, making people work 28 hours straight would break some kind of OH&S regulation. But this is how long the Senators were working in the upper house chamber overnight. At least by 9.30 this morning the Government was allowing Senators to leave in pairs for a shower break. In fact the debate on this Bill had been going since Tuesday and was debated for a total 40 hours. Independent Senator Nick Xenophon had said he didn’t think he would get home until at least Good Friday and Labor Senator Sam Dastyari earlier questioned whether he will be able to make it to the Madonna concert that he has tickets for on Sunday night. The Government and the Greens made a deal to change the Senate voting method to, in their words, better reflect the will of the people. The problem, in their view, is that too many Senators were elected on very small first preference votes and that the backroom preference deals have perverted democracy. The Senators supporting this Bill believe that it will improve democracy by empowering the voters to better be able to make their own preferences. They [the government] are defacto introducing a first pass the post voting system for the Senate. You can just vote one, advocate to just vote one, no consequences and you will see 3.4m Australians disenfranchised – their votes will not be used ultimately to determine who gets elected to the Senate. You will get 75% of Australians electing 100% of the senators. That’s a voting rort, that’s not Senate electoral reform. The Labor Party have stated that they believe these changes will entrench a Coalition majority in the Senate. This has been disputed by commentators from various sources. Something we have found interesting here at the CCF is the vast majority of media commenters are now saying that the Senate changes will be better for our democracy. Yet the vast majority of ordinary Australians that we speak to are very cynical about the changes. Couldn’t they have just ended it all and forced a vote? 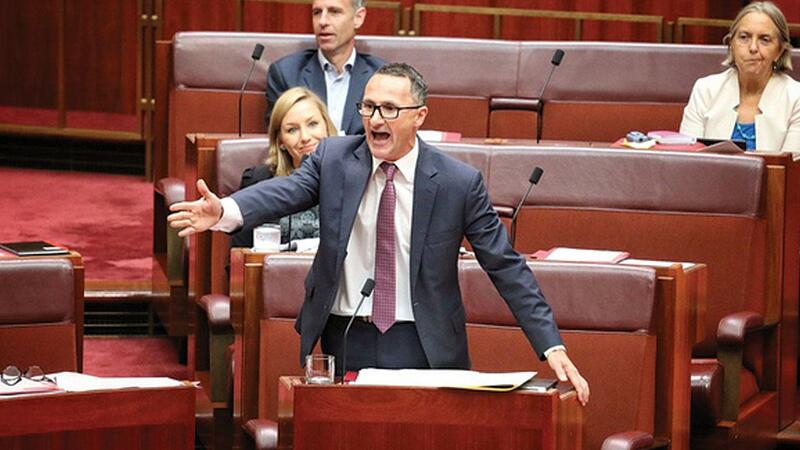 The Greens and the Coalition could have joined together to guillotine the debate and force a vote. So why didn’t they? The first thing to say is that Party Room functions in a similar way to almost any other Greens committee or body. Decisions are made by consensus, and when consensus cannot be reached the facilitator (the Party Room Chair) searches for a way forward that will satisfy everyone present and represent a genuine consensus. As with other bodies, a vote exists as a mechanism for breaking a deadlock; however, in my four years as a Senator I can’t remember a single time Party Room has had to resort to counting the numbers on a matter of policy. I’ve mentioned this to a few press gallery insiders, and their reactions have varied from the surprised to the sceptical. It’s hard to blame them given the way the other parties and the Parliament as a whole operate; nevertheless, the Greens meeting culture is alive and well in the Parliament. Regarding the management of the House, it will not surprise colleagues to hear that the Senate is not being as helpful as the House of Representatives would like it to be and the likelihood is that it will sit well into the night and into the early hours of the morning….My instinct is that we should continue to sit here in the House of Representatives and review the situation in the early evening….We will probably then suspend the sittings until the ringing of the bells, which means we could either come back tonight, if the Senate does deal with the matter expeditiously, which is unlikely, or come back first thing tomorrow morning and deal with it briefly in the House of Representatives….But [it] most likely is that we will suspend in the early evening and then come back when the bells ring first thing tomorrow morning. So MP’s have been sitting around waiting. Although with a Coalition majority in the House of Representatives, the Bill should pass easily through the House. We’ll keep our eyes out for any shenanigans. Some people have described the government’s tactics as bullying the legislation through. It’s been said that they were attempting to tire everyone so much that they run out of steam, the debate dies down and a vote goes through. It was reported in the Australian Newspaper earlier this week the passing of Senate voting change legislation is a clever political game that is being played to force the crossbench to pass the ABCC legislation. If the crossbench don’t pass the legislation, the Prime Minister can threaten to call a double-dissolution in line with Section 57 of the Constitution, and the cross bench Senators are unlikely to be re-elected (we can’t link to that article in the Australia because of the paywall, but google might get you there with the title of the article: The significance of Turnbull’s Senate Masterstroke). Something as critical as the ABCC could be judged as too important to be forced through the Parliament in such a one-sided way. The ABCC was first introduced by the Howard Government and soon abolished once Labor came into power. As soon as the next Labor government is elected the ABCC is likely to again be abolished. Perhaps a more bi-partisan approach should be adopted to find the middle ground for such a commission, rather than it being treated like a pawn in a game of chess. The Senate: Are they obstructive or constructive? In truth, the Australian Senate is very powerful. Section 53 of the Constitution outlines how the Senate is almost as powerful as the House of Representatives. Proposed laws appropriating revenue or moneys, or imposing taxation, shall not originate in the Senate….Except as provided in this section, the Senate shall have equal power with the House of Representatives in respect of all proposed laws. So the question is, will this Senate voting reform help to ensure that people are elected based on the will of the people? What about the will of Australians that vote for the major parties in the Senate? Some commenters suggest that democracy might be even further improved if we got rid of the line on the ballot paper so that people voting for the major parties elect the Senator they prefer from their chosen party? This might cease Coalition and Labor Party backroom deals about who gets the number one or two ticket. As always, let us know your thoughts in the comments section below or join the conversation on Facebook.